This Wednesday, Sept. 21, at 6:30 p.m., the Omaha Film Festival will screen a series of short films produced by local talents for the festival’s 48 Hour Film Challenge. I participated in the contest during the weekend of September 9th, competing against 25 teams that were assigned genres, lines of dialogue, and peculiar props to incorporate into short films less than five minutes long. Short films often take months—sometimes years—to develop and produce, so completing a project in just 48 hours was a mammoth undertaking. The challenge officially began with a drawing on the evening of the 9th, a Friday. Admittedly, I wandered around the event and eavesdropped to get a sense of my competition. Although I expected most teams to be competing purely for the fun of it, realizing how many experienced filmmakers were present was a sobering reminder that thousands of dollars in prizes were at stake. Festival officials reminded us that the point of the competition was to have a good time, but who were they kidding? We were in it to win it. Besides, no matter what project your producing under any circumstances, there’s always a part of you that secretly hopes your film will change the world. The drawing commenced and each team leader randomly picked one film genre out of a hat: comedy, drama, horror/thriller or romance. Each film would need to use the line of dialogue, “Ben knows how to get it done,” and a picture of actor Steve Buscemi as a prop. Prizes would be awarded to teams who found the cleverest ways to incorporate the elements into their films. After I drew comedy, my brainstorming session felt more like torrential downpour than light showers. I’d already put together a team of five actors, so it was daunting to find the perfect concept that would give all of them exciting roles. I completed a script later that night. It was a riff on hard-boiled detective stories that managed to give each of my actors at least one shining moment. The next morning, I shopped for costumes and props—keeping all of the receipts so that I could return the items as soon as the competition ended. Having worked on short film projects before, I learned that everything seems to go wrong during shooting. Considering a lack of preparation was part of the festival’s point, I anticipated nothing but stress and catastrophe. However, I was relieved by how smoothly shooting went that afternoon. After shooting wrapped, my team celebrated with dinner. I was so anxious to start editing that I could barely eat the cheese-fries I’d ordered—and that’s saying something! I was embarrassed by how quickly I rushed home, even dropping off a teammate a few blocks from his apartment and forcing him to walk the rest of the way so that I could save myself time. Every second the short film was incomplete felt like torture. When I eavesdropped at the drawing, most teams planned on shooting Saturday and editing Sunday. Knowing that I’d be too antsy to sleep Saturday night, I chugged three cups of coffee just before midnight and finished editing sometime around 4 a.m. 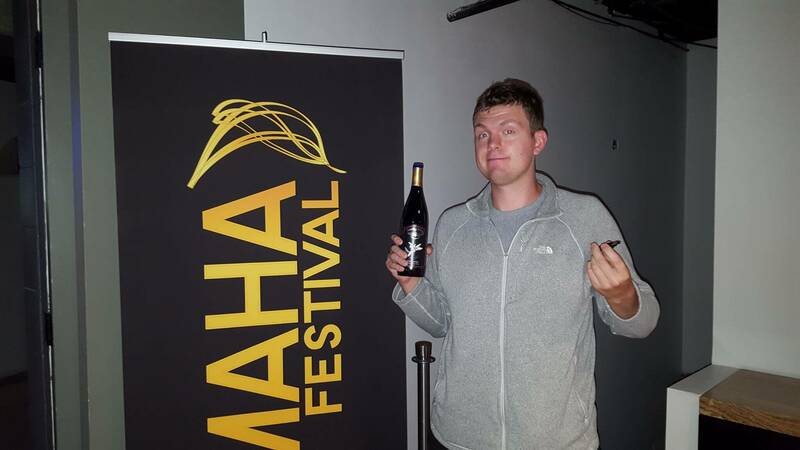 Films were due Sunday by 8:00 p.m. After a few last minute tweaks, I was the first person to turn in a film—and the first person to win a secret prize: a nice bottle of wine that I’ve been trying to open for a week, but it has a funky cork so I’m having issues. I’m sure it tastes good, though… After turning in the film, all the exhaustion of the 48 hour challenge finally hit me. Sleep came easier than usual that night. The 48 Hour Film Challenge screening will take place at the Marcus Village Point Cinema, followed by an awards ceremony. Throughout the challenge, teams posted behind-the-scenes photos of their films on various social media websites. I competed in a similar contest (not hosted by the Omaha Film Festival) years ago and was hugely disappointed by the final products. Judging the photos posted by competitors during the Omaha Film Festival’s 48 Hour Film Challenge, I expect to see a program of short films with impressive production values and clever storytelling. You should consider checking them out, too.